Two vampire clans coexisted for centuries, ruling the night with a tenuous but lasting peace. But when the Gargoyle clan began adding to their ranks more heavily, the Phoenix were forced to keep pace or perish. From there, the conflict that consumed the clans was inevitable, bringing both clans to the brink of extinction. Now, only the remnants of each once-proud group remain as both sides seek to discover their allies and capture the leader of the rival clan to finally end this conflict. 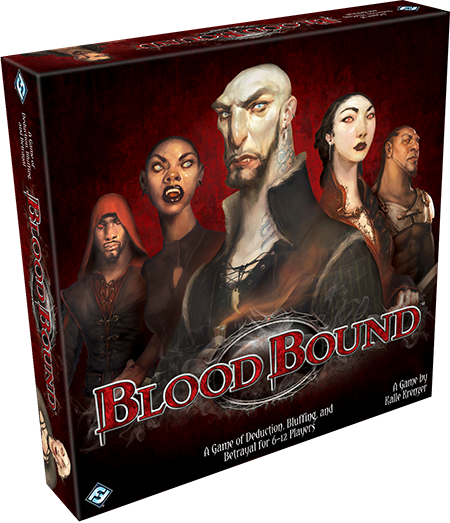 Gather your clan around you: Blood Bound is on sale now at your local retailer or online through our website! In this social game of intrigue and deduction, six to twelve players embody the dwindling survivors of two rival vampire clans, Gargoyle and Phoenix, pushed to the edge of extinction by war and treachery. You must unite with your allies and destroy the enemy clan—but who is a friend, and who a foe? Treachery and betrayal abound as you seek to identify the leader of the rival clan and capture them before they can discover your own leader. While every player’s clan loyalty and rank within the clan is secret, all communication must be done openly. Still, openly does not mean honestly. 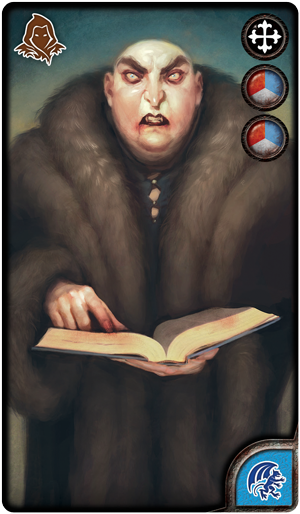 In Blood Bound, you may tell the truth as you deem fit, but you are free to lie through your fangs if it will protect your allies or throw suspicion on your enemies. In the meeting of gathered allies and enemies, the focus is on a single dagger, passed to each clan member in turn. When you are in possession of this weapon, you may either pass it to the player of your choice, or choose a target and attack. By striking another player with the dagger, you force them to suffer a wound and reveal a piece of information about themselves, such as their affiliation or their rank within the clan. The person with the lowest rank number is the leader of the clan, meaning that at the beginning of the game, you might not even know if you are the leader yourself. But even if you are not your clan’s leader, survival is preferable to the alternative, and you will always wish to avoid becoming a target. After you've suffered an attack and become wounded, you may find yourself in a weakened position as pieces of your identity are compromised, but you are still far from defenseless. If you choose to reveal your rank token, you may use the special ability gifted to that position. For example, a Berserker can launch a counterstrike against someone who attacked them, while a Harlequin can secretly look at any two character cards to lay their own suspicions to rest and perhaps enable them to sow discord within the rival clan. The Gargoyle and Pheonix clans are equally matched, with the same number of players devoted to each clan. 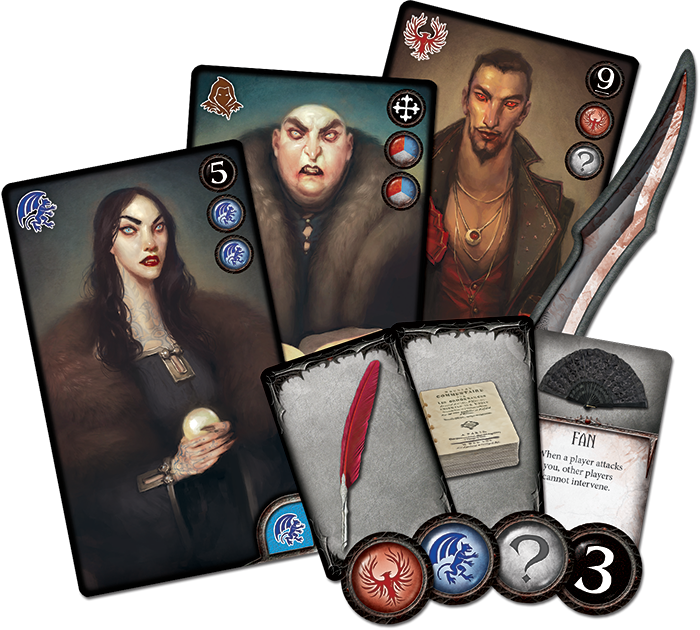 Still, if a game features an odd number of players, Blood Bound challenges the vampires with an added element of chaos as the Secret Order sends in an Inquisitor to maintain balance. Inquisitors have no affiliation to either clan, instead succeeding only in purging the vampires from the world if they are captured or if they inflict a curse upon the leader of the clan that would otherwise be victorious. By gathering scraps of information, you will have to deduce your allies from your enemies and attempt to capture the enemy leader. You must make your choices carefully. If you make a rash decision and capture anyone other than the rival clan’s leader, you have failed your clan and your team loses the game. However, if you wait too long to strike, the rival clan may make a bold move and capture your leader before you have a chance to attack. It will take every ounce of your cunning to make it through the night alive. Join the battle. Protect your allies, unmask your enemies, and ensure that your clan rules the night! Pick up Blood Bound (HB11) at your local retailer or on the Fantasy Flight Games website today!